Here's another JPG Magazine photo contest that's right up Haute Whimsy's alley! 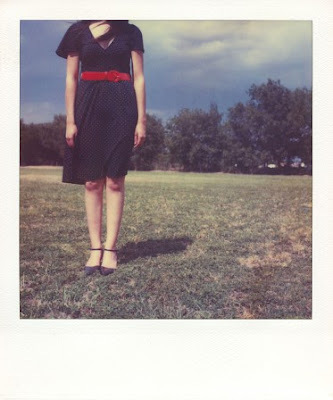 It's called Selections: A Celebration of Polaroid, and this was the winning photo! I love this idea and think that we all need to take a few more Polaroids! I used to have one of those Poloroid Instant Shot cameras but I have no idea what happened to it! I agree. Did they decide to continue making polaroids? Awww Polaroids! I love them! Didn't Polaroid go out of business? Do they still sell the film??? I love Polaroids! jen, thanks for stopping by my blog - love your blog, way cool stuff here so i am now your newest follower! Sending you my love on an early north wind and it will be carried in the beak of a Canadian Goose. There's something about polaroids that make you think of simpler times I think. Thanks so much for signing up to follow my blog. I have to tell you, I laughed out loud at that picture. I love Polaroids. Can't you just see them standing around waiting for it to develop and then discovering she had no head? LOL. I remember the delights of instant photos. So much fun when I was young. Mine all cut off heads too. I'm old enough to remember a time when there were no Polaroids! When Polaroids came onto the market, I was a teen. We were visiting an airforce base when some young airmen approached us girls and asked if we would like to see photos of ourselves. We answered "Oh, sure!" with dripping sarcasm. You can imagine our astonishment when they showed us our photos! i want an instant shot. there is something substanial about old photos. OMG I mISS THIS BLOG!!!!! I'm sad Poloroid is "out" but it is nice to see every now and again. I'd like to have a poloroid. Love polaroids!! They have such a vintage feeling that I love!